A lightweight backpacking tent is quite possibly the most critical piece of gear for backpackers. When looking for the best backpacking tents, we recommend focusing on safety and comfort and think they should be top considerations along with weight. It is also important to understand that there are no industry standards for backpacking tent sizes. Yes, technically a one person backpacking tent fits 1 person and gear, but that can be a little tight. Be sure to consider how much space makes you comfortable. If you want the extra space, choose a tent with an extra 1 person capacity. We have researched all the options for backpacking tents, with weight, comfort and safety as the highest priorities, and recommend the Big Agnes Copper Spur HV UL as your best option. In addition to our best backpacking tent pick, we have identified some other backpacking tents for specific needs. We have included the best 1 person, 2 person, 3 person, and 4 person backpacking tents. We have also selected ultralight backpacking tent options and more affordable budget options for those looking for cheap backpacking tents that still get the job done. 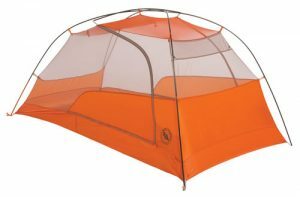 The Big Agnes Copper Spur HV UL Backpacking Tent is the best backpacking tent for sale and should be your top pick especially if you’re looking for the best combination of comfort and durability while remaining lightweight. The tent was designed to provide maximum comfort while being as lightweight as possible. There are lighter options to choose from on our list, but the combination of space to weight ratio and functionality makes it one of the best selling backpack tents on the market. The Copper Spur is part of Big Agnes’ Ultralight tent lineup. The free standing tent is easy to pitch and does include a few stake points for the rain fly and vestibules. It includes superlight poles and stakes, side door entry with decent sized vestibules for gear storage, and near-vertical sidewalls for extra space. Trail Weight: 1 lbs. 11 oz. – 2 lbs. Packed Weight: 2 lbs. – 2 lbs. 5 oz. Floor Area: 21 sq. ft. – 28 sq. ft. The Nemo Hornet Tent is an excellent ultralight backpacking tent. If you are willing to pay a premium for ultralight performance combined with quality then you won’t have many better options than the Nemo Hornet. With one of the lightest packed weights available, you’re not going to find too many tents with as many advantages as the Hornet. Most other tents in this weight range are single wall tents and tarp shelters that don’t provide nearly as much comfort and safety. Marketed by Nemo as an ultralight tent, the Hornet was designed to be as lightweight as possible. It includes superlight poles and stakes, 2 large side doors with a decent sized vestibules for gear storage, and interior pockets for storage and media. The Hornet tent holds up to intense weather including hard rain and winds using good design, a tight pitch and waterproof fabrics in the rain fly and floor. The tent body is breathable nylon, reduces condensation and the tent handles hot weather very well with great ventilation. All this while still saving over a pound of weight when compared to other similar sized backpacking tents on our list. To keep weight down, the tent does use lightweight materials. These materials sacrifice some durability when compared to thicker materials and do come at a premium price. If shaving some weight is your priority and you can sacrifice on a little durability and are willing to pay the premium price, take a look at the Nemo Hornet. One thing to note is that this tent isn’t totally free standing and requires a little more staking. 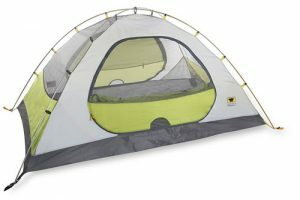 Upgrade: Buy the Nemo Hornet Footprint to help protect the tent floor and increase durability. 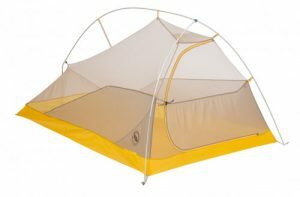 The Fly Creek HV UL is part of Big Agnes’ Ultralight tent lineup. The tent was designed to provide maximum comfort while being as lightweight as possible. It includes superlight poles and stakes, 1 front entry door with a decent sized vestibule for gear storage, and interior pockets for storage including media pockets. Like the Copper Spur UL, the Fly Creek HV UL tent is free-standing, holds up to intense weather including hard rain and winds using good design, a tight pitch and waterproof fabrics in the rain fly and floor. The tent body is breathable nylon, reduces condensation and the tent handles hot weather very well with great ventilation. All this while still saving over a pound of weight when compared to other similar sized backpacking tents on our list. To keep weight down, the tent does use lightweight materials. These materials sacrifice some durability when compared to thicker materials and do come at a premium price. If shaving some weight is your priority and you can sacrifice on a little durability and are willing to pay the premium price, choose the Fly Creek HV UL. One thing to note is that on all tent sizes there is only 1 entry point and vestibule. When backpacking with more than 1 person, having 2 doors and entry points is almost a necessity. Upgrades: The Fly Creek HV UL with mtnGLO® tent light technology includes an ambient LED lighting system that is not just a gimmick. It provides a real convenience for everything from reading before sleep to being able to easily finding your tent after leaving for a bathroom break. The lights have a dim setting which doesn’t disturb other campers in your area. 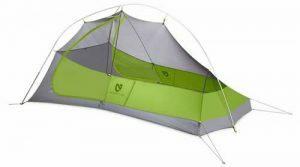 Buy the Fly Creek HV UL Footprint to help protect the tent floor and increase durability. The Mountainsmith Backpacking Tents are a great value for an occasional or entry-level backpacking tent. Many people who are looking for a backpacking tent in this price range are also looking for a tent that could be used when car camping as well. These tents certainly fit that description. The Mountainsmith Backpacking Tents are three season, freestanding tent that includes 7000 series aluminum alloy poles, side entry doors with decent sized vestibules for gear storage, and multiple interior pockets for storage including a gear loft. With the largest floor areas of any of the backpacking tents we reviewed, the Mountainsmith Backpacking Tents are very spacious tents for the weight. The manufacturer description for these products state the tents “performs way beyond it’s price tag.” We feel that is a very accurate statement. However, they usually miss our top pick because of a few reviews that mention a few problems with materials. The tents hold up to intense weather including hard rain and winds but make sure to follow the instructions printed on the stuff sack with particular attention to the rain fly. No-See-Um Mesh wall panels don’t seem to restrict airflow, reduces condensation and the tents handle hot weather well with great ventilation. The Kelty Backpacking Tents are another great value for backpacking tents and should be one of your top picks especially if you’re looking for an occasional or entry-level backpacking tent. There are lighter options to choose from on our list, but when you combine price with features this tent comes out near the top of our list. The Kelty Backpacking Tents are three season, semi-free standing tents with compact aluminum folding poles, super easy setup, a nice vestibule for gear storage, and easy entry side door. With quality and strong tent materials, the tents hold up to intense weather including hard rain and winds. With the rain fly fitting so closely to the tent, air flow can be restrictive and condensation may build up. If you normally camp or backpack in nice weather, this won’t be an issue. Overall, the tents includes many features that more expensive backpacking tents include, but the tents are made of 68D polyester material which makes for a heavier pack. Upgrade: Buy the Kelty Tent Footprint to help protect the tent floor and increase durability. 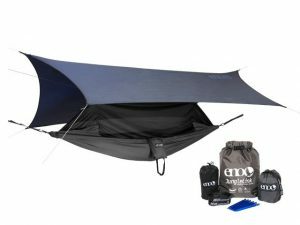 The ENO JungleLink Hammock Shelter System is the best value for backpacking hammock tents and should be your top pick especially if you’re looking for an entry-level backpacking hammock tent. There are lighter options to choose from on our list, but when you combine price with quality it comes out on top. Value – When you are venturing out into the backcountry wilderness and you’re possibly miles from the nearest shelter or your car, it is not the time to have saved money by buying a cheaply built tent. It could very seriously be life and death if your tent fails in a backpacking situation, especially when extreme weather rolls in. We feel that our top pick, the Big Agnes Copper Spur HV UL, is the best combination of comfort and safety. Our other options should be considered based on your specific needs and how much money you are willing to spend to meet those requirements. Comfort – If you are looking at backpacking tents, you are most likely considering only lightweight or ultralight tents. Besides weight, your comfort is going to be important at the end of a long day of hiking or if bad weather ruins your day. Most tents are sized to how many standard adults the tent will fit, not including gear and certainly not taking into account extra space for taller or larger-bodied backpackers. If you want extra space, choose a tent with an extra 1 person capacity. Also consider the number of vestibules and their size to store all your gear outside of the tent while still being protected from the elements. Durability – Durability goes hand in hand with value and quality. All of our top backpacking tents are manufactured by companies who stand behind their products. They provide quality lightweight backpacking tents built to last. Ultralight tents are most definitely going to have thinner and lighter materials, but even then, choosing the right tent to match camping conditions and where you camp are extremely important to the life of the tent. In addition, using proper footprints and understanding that basic tears and holes are easier than ever to repair, will go a long way to extend tent lifespans. 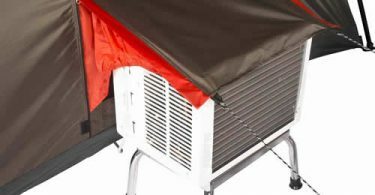 Airflow and Ventilation – You’ll know it when you wake up inside a poorly ventilated tent. Condensation will collect overnight and you’ll wake up to damp and soggy sleeping bags and clothing. Not a nice way to begin the day. When you exhale while sleeping, your breath is giving off about 1 liter of water. For every other person you are dealing with extra liters of water each night. That water vapor needs to go somewhere otherwise it stays trapped inside the tent and can soak gear. Ventilation is an important aspect of a good quality tent so all of the tents on our list provide excellent ventilation. Airflow is more important when facing hot and humid temperatures. Again, we have only picked tents with good quality materials to provide maximum airflow so the tents can be used in a variety of temperature conditions. If it cools down at night, the tents we chose have full cover breathable rain flys that provide warmth and a wind block when covering the tent. Weight – Your tent is going to be one of, if not the heaviest item in your pack. All of the options on our list are true backpacking tents and save on weight. Keeping weight down is critical to comfort and enjoyment while you backpack. With double wall tents now coming close to, even matching, minimalist shelters in weight, our top ultralight choice, the Nemo Hornet, maximizes comfort and space for every ounce of weight. For all the benefits tents bring, we recommend them over tarp and single wall shelters. Weather Performance – All of the backpacking tents on our list were designed to perform well in most weather conditions, keeping you safe, dry and warm. They provide protection against rain, wind and blowing dust, provide airflow in hot weather, and will do quite well when night time temperatures get colder. If you are considering a backpacking tent for winter backpacking, you could consider expedition tents, but we feel the Hilleberg Nallo GT is versatile enough for most backpackers considering taking on all 4 seasons.